To help identify a strategy most likely to reach a goal. Helps form a balanced picture of the risks and rewards associated with each possible course of action. Provides a framework to quantify the values of outcomes and the probabilities of achieving them. Clearly lays out the problem so that all options can be challenged. 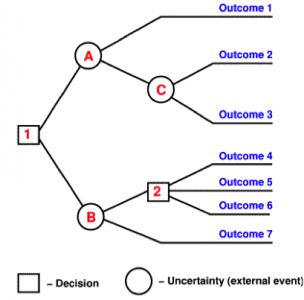 Decision Trees are excellent tools for helping choose between several courses of action using a tree like graph. They provide a highly effective structure within which you can lay out options and investigate the possible outcomes of choosing those options. Mind Tools. “Decision Trees.” Decision Tree Analysis. N.p., n.d. Web. 19 July 2012. <http://www.mindtools.com/dectree.html>.